Jill DeWit: Good day, sir. Ow, I just laughed. Jack Butala: Boy, somebody’s feeling better from their surgery, I think. Jill DeWit: Thank you, although that one accent made me laugh and that hurt so I gotta be careful. Jack Butala: Welcome to our show today. In this episode, Jill and I talk about laughing at the Haight. Jill DeWit: All right. Don’t make me hurt too much. Yes. Jack Butala: Before we get into it, though. Let’s take a question. As always, posted by one of our members on the landinvestors.com online community. It’s free. Jill DeWit: Cool. All right. Hey, by the way, I gotta, since we laugh at this often, I gotta bring this up, Jack. When will LandInvestors not be SuccessPlant? Do we know? Jack Butala: Yeah, soon. Within 30 days. Jack Butala: Actually, way less than that. Jill DeWit: So here’s a tip. If you’re looking for it, it’s on SuccessPlant, but that’s gonna change so full disclosure. Jack Butala: You can get there through LandInvestors very easily. Just click through it. Jack Butala: Ken, I’m so glad you asked this. I mean it. We get this question a lot and I’m glad that it got included in the show. The whole reason for you to have a website at all is to provide a place where you draw traffic, land-buying traffic back to, so that they can click on it and put their credit card information in and buy the property from you. That’s it. That’s the reason you have a sell side website. It doesn’t mean you just post it on the site and it’s over. You have to draw up traffic back there and how do you do that? You do it by listing property on Land Pen, Land and Farm, Land Watch, Trulia, Zillow, ebay, Bid 4 Assets, all the places that you can think of, Craigslist. And then, so when they bite on the, when the fish bites on the lure, you pull up the line to really sink that hook into its mouth on your website. That’s the reason. So that’s how you do it. You, I would highly recommend getting a developer as inexpensively as possible in the beginning to develop a woo commerce, a woo eCommerce website. And in the, we are just about done with connecting ShellPay, which is a real estate-based, it’s a credit card provider just like PayPal of real estate people in the industry. So you can connect that to WooCommerce and you’ll be all set. Jill DeWit: Here’s what you can do. And do you want the credit card part of it, too? Okay, great. Jill DeWit: They can do that, too. Jack Butala: That’ll be released with ShellPay. So what’ll end up happening is you’ll go to a website, you’ll say, “Oh, I like the way this template website looks and I like the way this [inaudible 00:03:14] looks, here’s my 500 bucks or whatever it is,” and then in 24 hours, you get the website and you’re done. Jack Butala: Is it there? We don’t have it, but before the end of the year. Jill DeWit: Good. I’m excited. Jack Butala: But right now, I don’t know how far along Ken is and he needs a site, so he can just go to any given WordPress developer. It should cost you around 500 bucks. Jill DeWit: Awesome and get that done. That’s so cool. And then as far as [inaudible 00:03:41], some of our members that talk about two sites is an acquisition site. Did you cover that? Jill DeWit: Okay. I think that’s when Ken’s asking because what we used to do and we still have one out there because of old mailers that are still coming back for years later, but we still maintain an acquisition site. But nowadays you know and that was a whole thing for awhile we were all thinking, keep an acquisition site so those people don’t see what we’re marking up the property for. Right? You know what? Then we’ve all come to realize they don’t really care. Jill DeWit: So. You may or may not want to do that. You don’t really need to do that. And I, you think two sites? Jill DeWit: You know what’s so funny? I still like the one, I’m like the one site thing. Because they will find you. Jack Butala: …put an offer on their property, they first thing they do is go to Google and check you out. And you want to have a good, strong internet presence. Jack Butala: Maybe with a picture of your wife and your dog and the kids and stuff. It says, “Hey, we’re just real people. Look at the picture. We’re just real people. We’re buying some property on the side.” It’s gonna get them signing that offer and picking up the phone so that’s harder to do on a sell side site, Jill. And I think the way that the internet is, and it’s so cheap that I just think that kind of site, you can get done for 200 bucks. Jill DeWit: Well, they’re gonna find you anyway. The right person they’re gonna, the right seller. They’ll track you down so much that they’ll track me down and know that you’re related, you’re in my world kind of thing. Jack Butala: In Land Academy scenario. Jill DeWit: Yeah. That comes up now once a month. Jack Butala: Who is this guy for real? They reach out to us. Is this guy for real or not? Jill DeWit: Totally. I had one that a guy said, “I hope it’s okay. She wanted to know if I was legit and I told her about you guys.” And I said, “Yeah, that’s fine.” It was all good. So it was really funny. Yeah, no worries. It’s all good. You need that credibility. It’s all about credibility. Jack Butala: Right, right. [crosstalk 00:06:07] You are welcome to use our credibility. We have lots. 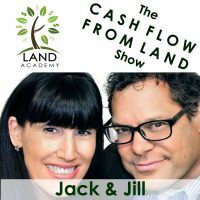 Jack Butala: You have a question or you want to be on the show, reach out to either one of us on LandInvestors.com. Today’s topic: laughing at the Haight. This is the meat if the show. When you send out thousands of letters a month, offers a month to buy people’s real estate or their cars or their houses and they are undervalue a lot, you are going to get some angry people. This show is about what to do about that and how to minimize it. Some people it really bothers. Some people just laugh at it like me. What do you do, Jill, to minimize the Haight? Jill DeWit: Both. I mean both. I take it with a grain of salt. I get it and I always … well, this is years ago so now I have, we’ll get to that in a minute, a way to solve this problem but back in the day when I’m just answering all the phone calls as they come in, out of ten yes or whatever, there’s gonna be a few “you must be crazy.” Some might be really mad that number one, they don’t know how you got their information and they’re mad about that. Number two, they don’t like they offer. Number three, how dare you? It’s just kind of funny. So I would just listen to them, let them vent a little bit and maybe apologize if it’s appropriate and if you could, even make a joke out of it like, “Oh, I guess I forgot a zero” if that was their issue” kind of thing. And then send them on their merry way. Don’t waste your time and don’t waste their time. Get it over with. What’s interesting is a few of them, they might come around. They might be calling you because even though they’re hopping up and down mad at your offer, they do really want to sell. It’s just not the number they want. So you might uncover something in there that works. And then maybe sometimes too that they don’t know that much about their property. They think, we all think our asset is priceless. But when you send them a map or two and they go, “Oh, really, that’s what it looks like?” You know what I mean? Seriously. They might go, “Oh, okay. I guess you aren’t really far off from it.” Yeah, no. I go, “How many offers have you had?” And they probably go, “None.” So okay, next. And there you go. So. Jack Butala: Here’s the ultimate way to laugh at the Haight that you generate by sending offers to owners. Have someone else answer your phone. Jack Butala: There’s no Haight at all. Jill DeWit: Yep, that’s where I was going. Jack Butala: Oh, good. Okay. I’m sorry. Did I steal your thunder? Jill DeWit: No, no, no. It’s all good. That’s the easiest way to solve it. And we’re gonna do that for people here ourselves with Jill Live but a lot of our members solved it themselves awhile back before we even thought about doing Jill Live with those companies, outsourcing a third party to answer your phones for you. And they’ll take the Haight out for you. They’re used to it and it’s okay. Jill DeWit: Yeah, that’s what coming with Jill Live. You can have your call, I have a templated script if anyone wants to start with that. And then just tweak it as you go. That’s what most people I think are gonna do. And then you can have the data delivered to you however you want. Do you want them to forward calls? Do you want them to text you? Do you want them to email you? I have them email me on a daily or weekly basis of all the calls that they take and it has all the information. It has the seller, the property, did they like my offer? How quickly do they want to sell? All that goo stuff. So they weed it all out and it’s really really a great thing. Jill DeWit: To do this. But you should be a deal maker, you should be answering your own phone like a receptionist. Jill DeWit: That’s the thing with people in our world. We’re serious about doing this. This is not a hobby. And we want to do a lot of volume. So you gotta weed out the silly stuff. Jack Butala: That’s right. Well said. Jack Butala: That being said, it’s really fun to when people just blow their tops because they got a thousand dollar offer and they think their property is worth 10 million dollars. Jack Butala: Sometimes it is. Sometimes … I’ve made mistakes in mailers before early on. Some they were right. Man, they still sell the property to you. Jack Butala: If you’re not generating Haight, you’re not doing this right. Jill DeWit: We have had, we have all shared with our members on our weekly calls, some funny stories over the years about, “You’re not gonna believe what this guy told me.” And we all giggle and about people making up new words that don’t exist. Because they’re just so funny. It’s interesting. Jack Butala: They’ll still get through. A few of them will find you and they’ll get through and they’ll leave you a message. And if that happens, post it unsuccessful and no matter how harsh and nasty it is, just think it’s so funny. Jill DeWit: Oh, we love them. And the letters that people get back are just hilarious. Jack Butala: There are some artists out there. They can draw a middle finger really well on your offer and mail it back it you. Jill DeWit: Exactly. It’s the, I think it’s funny. You can’t get hung up on it. You know what it is? It’s not you; it’s that person. It’s that same person whose probably yelling at the guy who just left the pizza mailer on his door because he didn’t want to have to get up and move the pizza … you know what I mean? Jack Butala: Right. They’re just mad at the world, man. Jill DeWit: Exactly. It’s not you. Jill DeWit: You have to … for me, that’s how I look at it. Jill DeWit: And I’m not trying to be a bad person or take anything or whatever and it’s all good. If back in the day when I talked to them, and I got that point across, it was fine. I mean really. I used to take it. Here’s what’s totally funny. In the beginning, I took it as a challenge. I’m like oh. I was, I don’t know why. I’m crazy that way. But I took it as a personal challenge to befriend that person by the time the call was over and I usually succeeded. Jill DeWit: Because that’s just fun for me. Jack Butala: I like to fire it back in a laughing way. Jill DeWit: Exactly. It’s so funny. Jack Butala: The takeaway from this is twofold. Number one: if you’re not generating Haight, you’re not pushing it hard, pushing the line hard enough. And number two: you don’t have to deal with at all. You can laugh at it from afar by outsourcing who answers your phone. Jack Butala: You are not alone. You are used to ambition. I don’t know why it just cracks me up. It’s probably two decades of dealing with it that I just think it’s funny. Jill DeWit: Right. Well, it doesn’t take you long with one mailer. The first few calls, you’re like, “What have I done?” But then in a few carefully left voice mails, so … But then I think one mailer, most our folks are like, “All right. We’re over it.” And then we’re preparing them like we are right now. Just be ready. It’s gonna happen. It’s not you and it’s okay. Jack Butala: That’s why we do the show so there’s no surprises and we’re trying to take all the risk out of it. Jill DeWit: This is one of the bads. But is it really that bad? No. Jill DeWit: That’s it. Look at the people that are jumping up and down in the airport and all that stuff. I’m like, “Oh, my gosh.” You know? Look what those poor people have to deal with. Jill DeWit: I know. I hear you. Jack Butala: Information and inspiration to buy undervalue property.